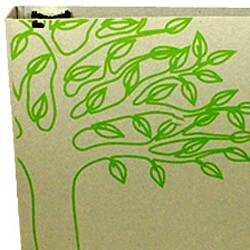 Chip board binders are an eco-friendly personalized ring binder solution that has a natural, vintage look. They come in many thicknesses from very flexible and thin chipboard to thick and sturdy chip board that cannot be bend; so you can choose what works best for you. 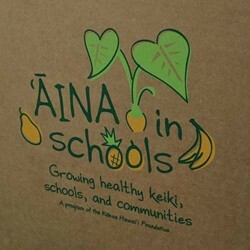 Printing on these binders is completed with vegetable-based eco-friendly inks as well, so you know you are getting an all-over "green" ring binder. Perfect for the earth-conscious client, or those who brand their company in a more natural or vintage-looking style. Check out the photo gallery on this page to see just a few of the custom branding options we offer for eco chipboard binders, then call us at (866)537-2244 (866)537-2244 or email info@buy101.com for a price quote. All of our personalized ring binders are made in the USA, and minimum order requirements start at just 100 binders* with bulk pricing for higher quantities. To complete the look, add custom index tab dividers, which can also be made of chipboard and many other materials. If your business is eco-conscious and needs presentation materials or filing supplies, consider requesting a quote for custom chipboard binders from Binding101. The chipboard is made from 100% recycled materials, creating a unique look for each individual binder that can vary from brown to gray in color, and sometimes include speckles and natural discolorations. 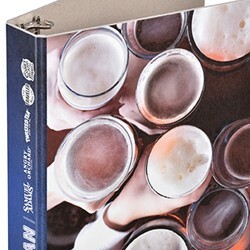 The beauty of a custom environmentally friendly binder is partially in this uniqueness, and partially in the printing itself. We use vegetable based inks, so even the printing stays "green" for an all-around earth-friendly solution. Printing onto the natural brown material will cause some dulling of the color vibrancy, which plays well with the overall look, however, if you want more of a pop, request a "hit of white" underneath the design to create a cleaner starting canvas. The white is aligned perfectly with the design, so won't bleed out or show behind it. Another great feature of chip board personalized binders is that the boards can be made from flexible and thin, up to so rigid and thick it cannot be bent. The minimum order requirement for chip board binders starts at 100 pieces*, and price breaks typically come into play at 250, 500, 1000, etc. All binders are made in the USA at our production facilities that hold quality standards to the highest regard. Shipments from the USA ensure a fast shipping time and lower shipping cost than overseas shipments. Call our custom product experts at (866)537-2244 (866)537-2244 to discuss your individual needs and request a price quote. Consider also adding custom printed index tabs which can be made in chip board, paper, or poly and can help keep your brand image consistent across many platforms of marketing. Some of the most popular printing options are listed below. 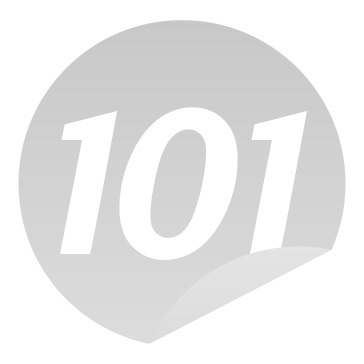 In addition to these, there are also innumerable opportunities for customization of your ring binders; give us a call at (866)537-2244 (866)537-2244 or email us at info@buy101.com to speak to a custom product expert. 1 Color printing is one of the most popular options, as it offers the ability to customize a ring binder with your 1 color logo, contact information, and more, keeping the price low while still giving you a one-of-a-kind look. Our ink is very opaque, which allows us to print light colored ink (such as white) onto dark materials (like black). Some materials could use a little extra pop in this case, however, so can opt in for a 1 color + white underlay, which puts down 1 hit of white ink below your design so the colors of your ink are sure to pop. 2 Color printing offers more versatility, so you can create a more vibrant look that will grab the attention of your clients. Whether you are printing a 2 color logo, or you just have a 1 color logo but want text written in a different color, this is a great option. 3 Color printing offers even more versatility, so you can print more complicated logos. To the left you will see that yellow, light green, and dark green were printed. The brown that you see in the design is called a "reverse print" which is empty space that shows the color of the binder. You can also see that the colors touch each other, which is called "close registration". 4 Color process, also known as full color, is a premium solution for those who wish to print photos, graphic designs, and more onto ring binders. This is a popular choice for large corporations and brand names that will not modify their brand image to keep costs low. With a 4CP custom binder there is no limit to the number of colors, tints, or shades that can be printed. * The minimum quantity for custom binders is the starting minimum, and could vary depending on the specific customization needs. Flexible chipboard binder minimums start at 250 pieces. Call (866)537-2244 (866)537-2244 to discuss your individual needs and determine the minimum order requirement. Q: What color are they? 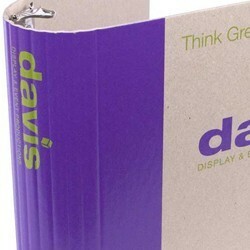 Chip board binders are made of 100% recycled products, so the color can vary from piece to piece. This plays into the "green" very well, and the overall color can vary anywhere from brown to gray. Sometimes there will be flecks or specs on the material as well. The beauty of eco-friendly binders is in the uniqueness. Q: Will the ink stand out on the brown color well? Our inks, though opaque, do look slightly muted when printed onto the natural brown/gray material. If you want a stronger contrast or a more accurate color match, then we can place a "hit of white" below your design, which creates a clean base to help your colors pop more. The white does not show below the edges of your design, but is completely covered. Q: What do I have to send you for the design to print? Please review our artwork requirements to see the file type and size that we require to create the highest quality custom binders. If you need help with the file, we have an art department that can assist with certain types of modifications. Q: Do you have more binder options? Yes! Our options for custom ring binders are truly limitless; please call our custom binder experts at (866)537-2244 to discuss your exact needs, so they can guide you in the right direction, or visit our general custom ring binder page to see some of the varieties we offer.